I am so digging this drawing. As with all of Ava's drawings, there's a story here, albeit a short one. 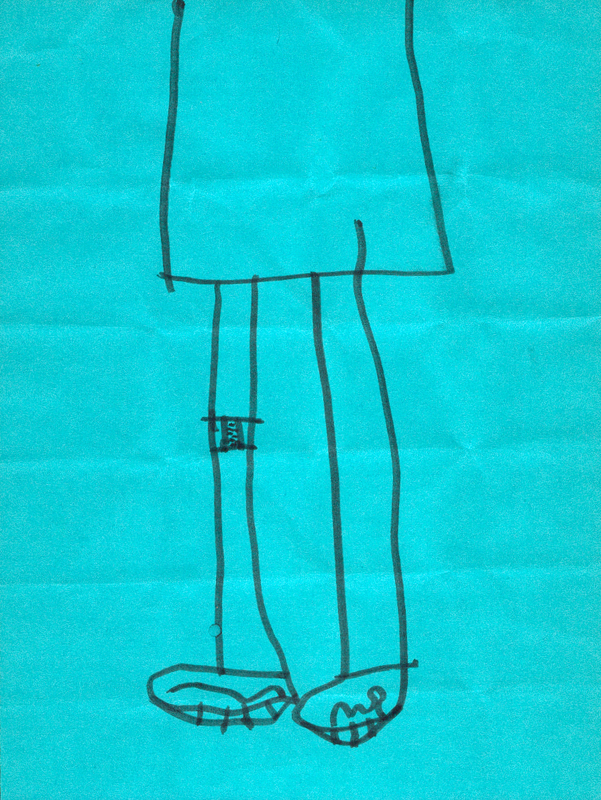 When I asked her to tell me about this drawing, she said, "She has a boo-boo!" That's it. I love the composition, where we see only the bottom half of the subject. No need to see the girl's face or arms -- just the main point of focus: the band-aid on her knee. And don't you just love the sneakers? I do too. There's something in this drawing that really appeals to me. The way Ava drew the dress down from off the top of the page, and how the legs come straight down -- I dunno, there's just something about the execution of this that makes me realize just how proud I am of my daughter. Yes, I am the stereotypical Proud Father, but I think I have every right to proudly showcase my girl's artwork to as many people as I can. She is my girl. My one and only Ava, with whom I share a special bond. She is like no other, and I am so happy to have her in my life. always fun to check out "ava thursday" - always amazed! that is so cool... she's a chip off the ol' block. Keepin' it simple! It's amazing how well Ava understands graphic communication. She intuitively draws only what's necessary, and leaves out the clutter. Great to see Ava's brilliance in progress! I think she's beginning to understand the fundamentals of art! Keep up the good work! Sure this isn't a self-portrait? The left sneaker's laces read 'me'! i love how you talk about your daughter - no wonder she is so talented - with someone having such faith in her how can she not. Swweetttt! This is definitely striking stuff for anyone so young. I agree with Dave,real chip off the ol'block. Can't wait till my nephew Adam is old enough to draw properly like Ava. Right now he's 2 years old and could only draw squiggly line and circles. Hope you'll keep all of Ava's drawings safely in a chest or something,then compile and publish it when she's a lot older. ^^ Knowing Ava,she'll be a budding artist when she grows up. I love them all but this one especially is so sweet and dear! thanks Ava you make me smile! I love the focus and perspective. I love that she went out of the box for this. I love that it wasn't just a picture but a picture that had a theme and knew where the perspective best suited that theme... And she's a kid. Artistic genius in the making!